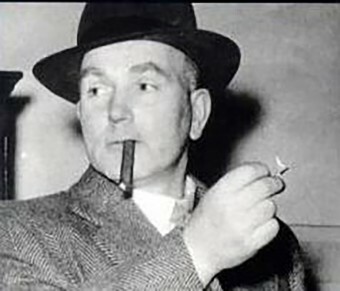 On March 30, 1905, an unassuming and dapper Englishman named Albert Pierrepoint was born who would one day own a pub in Lancashire called “Help the Poor Struggler.” He would also have another job that was a bit more unusual – Great Britain’s Chief executioner. His atypical trade was a family affair. The Pierrepoints occupy a unique place in the British justice system, as Albert’s father and uncle also served as public executioners. He was unaware of the nature of their business as a child, but when he discovered the truth in his teens, a desire to follow in their footsteps began to grow within him. He applied to the Home Office in 1930 for inclusion on the list of official executioners, but even nepotism couldn’t help him win a spot – he was told there were no vacancies. A year later, he was accepted at Strangeways prison as an assistant executioner after a week of intensive training – and subject to his conduct during an actual execution. He acted as his uncle Tom Pierrepoint’s, then the chief executioner, assistant, and did the job well. By 1941, Albert was Britain’s new chief executioner, a job he carried out with dignity, compassion – and precision. Pierrepoint never spoke of his occupation while still employed. It wasn’t until he retired and wrote his autobiography Executioner: Pierrepoint that he commented at all about what went on in the execution chamber. His book is completely devoid of sensationalism and never makes light of the gravity of capital punishment. During his career, Pierrepoint hanged more than 400 convicted felons, mostly murderers, but a few convicted of being traitors as well. At one time, a sentence of hanging meant a slow, tortuous death by strangulation, but Albert went to great lengths to ensure the condemned prisoners he executed died as quickly and humanely as possible. How did Albert Pierrepoint feel about capital punishment? The fruit of my experience has this bitter after-taste: that I do not now believe that any of the hundreds of executions I carried out has in any way acted as a deterrent against future murder. Capital punishment, in my view, achieved nothing except revenge. Albert Pierrepoint retired in 1956 and passed away in 1992. Capital punishment was abolished in Great Britain in 1965.